Last Thursday evening, after a long day of work I had the pleasure of attending a local Chicago Blogger Event. Rockit Bar and Grill was kind enough to host us, and it was a perfect venue. 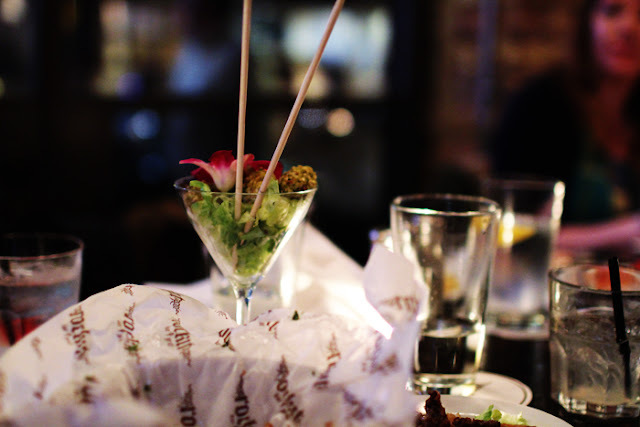 Downtown hot spot, some delish food and drinks, & a great scene! Definitely one of those seen and be seen at kinda places - perfect for a night out!! I plan out heading there again soon!! Especially once the temps get warmer & the rooftop is in full swing!!! I had a blast meeting so many Fabulous ladies, so many of who I read regularly and didn't even realize were Chicago ladies until the planning got serious! A big thanks to Danielle, for organizing this! So excited to get working on the next one!!! And if you are in Chicago and want in, let me know - I'll get ya on the list! hehe! Here are a few shots from the evening (excuse the weird look I have in every shot, I am blaming it on the exhaustion from a near 11 hour day of work before heading there). And BIG Thanks to Alaina and Danielle for taking and sharing some photos!!! I was a rockstar and realized halfway through the day my camera was sitting at home! wa-wah! Wearing Zara shirt, high-waisted jeans and wedges...yes it is like it is still winter here! 'Grape Nuts' - my new fav snack, going to try and make at home soon! Grapes covered in goat cheese dipped in crushed pistachios! And here is a list of the lovely locals! (HA, love the way that sounds!) Go visit!!! 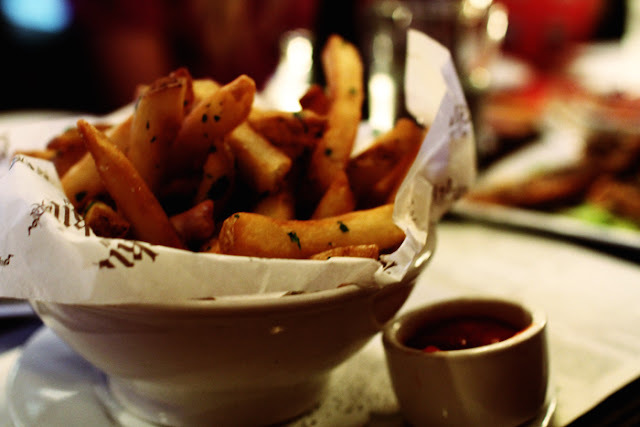 mmmmm truffle fries! My FAVE! Oh how fun! I love meeting other bloggers IRL. And I love Danielle's blog. Now I am going to go over this list of blogs tonight and find some other favorites. sounds like a great night...so fun to meet your blogger besties! and i love rockit! good choice!!! What a great night! I would love to attend some local blogger events, so if you can add me to the list, I would greatly appreciate it! Thanks, Taylor! Love the Zara top, by the way! I would totally love a blogger event in Chicago! Would you mind adding me to the list as well? Thanks Taylor! This is so cute! 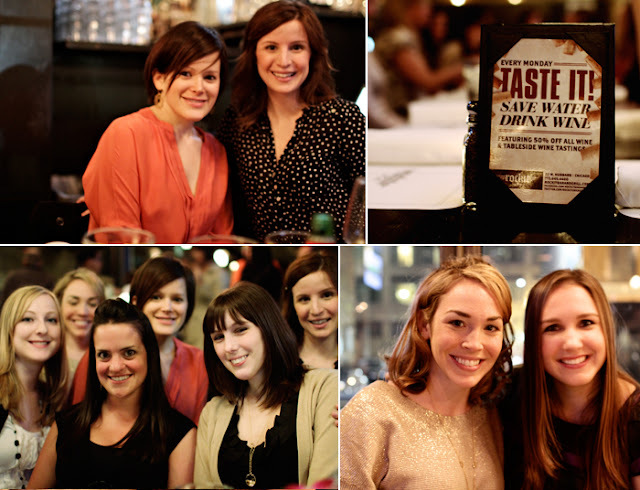 If I move home to Chicago, I want to be included in the next one ; )Such a fun event. Everyone is adorable. How bummed am I?? Looks like a FABULOUS evening! I swear this was the best kept secret since Kate Middleton's dress reveal! I visit at least half of these blogs almost daily & never saw it mentioned! Soooo sad I missed it, would have loved to meet some of my faves in person :( Pleeeease let me know next time! P.S. Just saw your clutch on Frankie Loves Fashion today. LOOOOVE!! I'm adding the orange with purple zipper to my faves - how fun for summer!! Lucky lady and glad you had a good time! so fun! can't wait for the next one! FUN!! 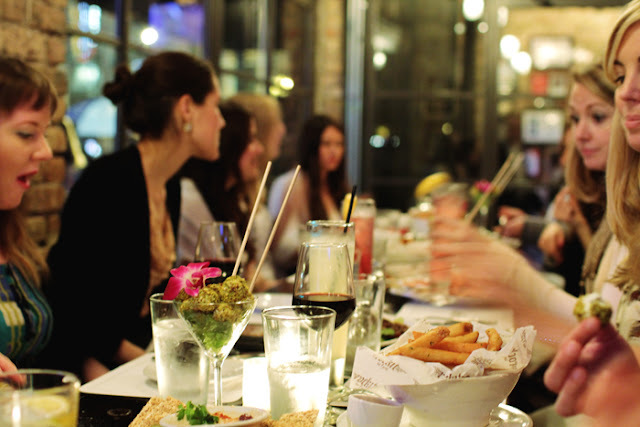 I love these meet-ups, but I've yet to meet up with an entire group of bloggers. How fun! I love blog events! these pictures are so cute!!! 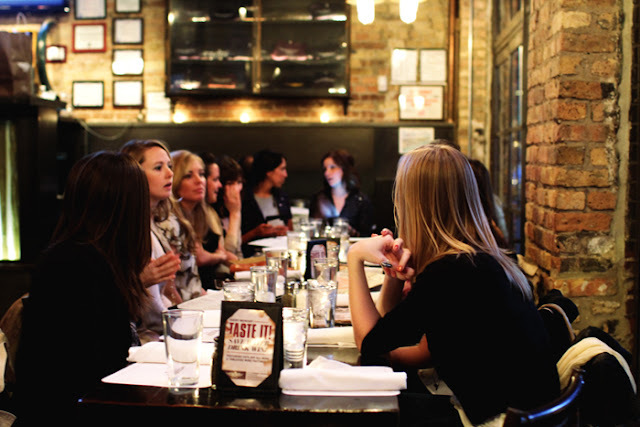 Looks like Chicago has a fab group of blogging ladies! I'm going to hop over to check out all of these! It looks like you all had an absolutely blast, and you're such a stylish bunch! Had SO much fun! It was great seeing you again. See you Tuesday! Looks like you ladies had a blast!! Sign me up for the next round! love this! makes me want to be a part of the chicago blogging circle. and i def added rockit to the list of places to visit when i'm in chicago next month! so so cool! makes me feel like i need to get a south florida bloggers group together. yay for bloggers! this looks like the best time! i want there to be a tampa meetup soon! and these pictures are great!! Grape nuts? Yum- how delicious do those sound?! I would love to get on the list for the next one since I'm moving there next month and I know about ummm, 2 people in the city. I would love to meet some fun bloggers in my new home!